Do you have a page devoted to Hollis ancestors or history? Let me know & I'll put your link below! Did you know there is also a town named Hollis in the state of Maine? Visit the website for Hollis, Maine which was originally incorporated as Philipsburg in 1798. 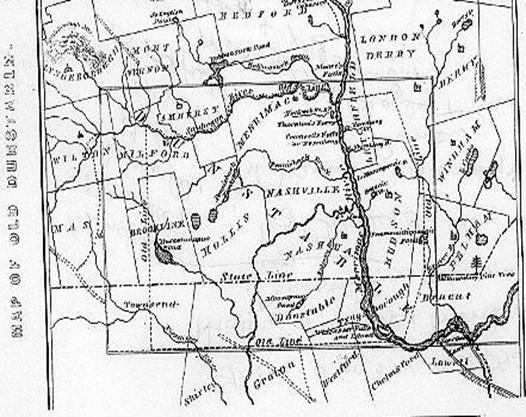 The boundary disputes between Massachusetts & New Hampshire, and the various annexations and redrawn boundary lines between the towns in this area, make colonial research quite a challenge. I've learned to be flexible, & search surrounding towns vital records, histories, etc. My ancestor, Thomas Dinsmore, was among the first to settle in Hollis, arriving about 1733 with his wife, Hannah (pos. surname WHITAKER) & children. Their son, Abraham married Lydia (nee JOHNSON), & some of their children were born in Hollis before they relocated to Temple, NH, about 1764. I am descended from the union of Abraham & Lydia, thru their son Zebadiah Dinsmore who was born in Hollis. Though I myself have only visited Hollis, I have learned a great deal about this lovely Hillsboro County, New Hampshire town. I hope this page will serve to aid others researching ancestors in Hollis. Please let me know if you have any suggestions for improving this page. · familysearch.org - 1880 Census Index - Excellent resource!!! o Prologue, Spring 1996, Vol. 28, No. 1, "First in the Path of the Firemen" The Fate of the 1890 Population Census,” by Kellee Blake. For further information about cemeteries, contact the Hollis Cemetery Trustees. Just a thought: It is strange to think that I may have been "warned out" or sent to Rhode Island by my ancestors...or maybe not. I will post Hollis, NH QUERIES here. at Rootsweb message board for Hillsborough County, New Hampshire. There is also a board for all New Hampshire. Ann reserve the right to edit or delete any query you wish to post. Submitting a query to Ann via e-mail is an acknowledgment of your agreement to allow me to post, edit or delete your query, & use your e-mail for replies to your post. I am looking for information about the family of Thomas and Polly (JEWELL) FARLEY. Thomas was a son of Caleb and Elizabeth FARLEY, and was born in Hollis, NH on Dec. 28, 1769. Thomas married Polly JEWELL in Hollis on Dec. 16, 1794. Polly was born on Nov. 26, 1768 in Dunstable to Benoni and Dorcas JEWELL. I would greatly appreciate hearing from anyone who may be researching, or have any information about this family. Thanks for sharing. 1801 May 31. Also, Eleazer HALE of Dunstable and Sally JEWELL of Hollis were married on 1805 Sept. 16. Is anyone else researching these surnames? I'm researching our JEWELL ancestry, and wish to correspond with anyone else regarding the above. Thanks for any info. Art Burch. know. I traced the line backwards to Amos Freeman who married Dorcas Parish. He was from CT, she from NY. Other family surnames are Pool, Davis, Brody. Thanks - Irene Weimann. Caleb STILES b. 1737, Middleton, MA, m. 7 Feb. 1760, Hollis, NH, Mary/Elizabeth TOWNSEND. When & where was Mary/Elizabeth born? Was she the daughter of Nathaniel TOWNSEND, a resident of Hollis by 1755? Caleb STILES owned land abutting that of Nathaniel TOWNSEND in 1763. I invite e-mail from anyone with connections to either of these lines. Tinklepaugh, Joan Child. Hollis Family Album - 1730-1950. First Printing March 1997. The Town of Hollis lies in the southern part of the county, and is bounded as follows: On the north by Milford, Amherst and Nashua; east by Nashua; south by Massachusetts, west by Brookline and Milford. Nearly all the territory embraced within the bounds of the present town of Hollis originally comprised a portion of the old town of Dunstable, which was granted by Massachusetts October 16, 1673 (O.S. ), and embraced the present town of Tyngsborough, the east part of Dunstable, a narrow gore on the east side of Pepperell and a tract in the northeast part of Townsent, Mass., and the towns of Litchfield, Hudson, portions of Londonderry, Pelham and nearly all the present towns of Nashua and Hollis and parts of Amherst, Milford and Brooklin, in New Hampshire. December 28, 1739, the westerly portion of Dunstable was erected into a separate and distinct precinct by the government of Massachusetts, and went by the name of West Dunstable until April 3, 1746, when, in answer to a petition from the inhabitants, about one-half of it was incorporated with full town privileges by the Governor and Council of the province of New Hampshire, and named Holles. In The History of Hillsborough County, New Hampshire (1885), D. Hamilton Hurd discusses the origin of the Hollis name as follows: "I think there can be no reasonable doubt about the origin or orthography of this name. Benning Wentworth was Governor of the province, and owed his position to Thomas Pelham Holles, Duke of New Castle, who was colonial secretary. It is well known that Governor Wentworth named many of the towns in this State in honor of his friends, sometimes when the inhabitants had petitioned to be incorporated with a name of their own choosing, they preferring to accept a name which was distasteful to them rather than incur the Governor's displeasure, and perhaps refused to grant their charter. As to the orthography of the name of the Duke of New Castle, I think John Farmer is mistaken in writing it Hollis, as there are manuscript documents in the office of the Secretary of State to which the duke signed his name, 'Holles New Castle.' That the town was named for him I think there can be no question; and because of his ignorance and detestable character, its citizens were justified in changing it to Hollis, as they evidently did to perpetuate the name of Thomas Hollis, the benefactor of Harvard College." --I. W. Hammond. In referring to this matter, Judge Worcester says: "Within my remembrance, there has been much controversy upon the question whether the name of Hollis should be spelt with the letter i or e in the last syllable, and also as to the person in whose honor the town was named. Mr. Farmer, in his 'Gazetteer of New Hampshire,' spells it with an i, and tells us that the name was either derived from the Duke of New Castle, whose family name was Hollis, or from Thomas Hollis, a distinguished benefactor of Harvard College, Mr. Farmer spelling both names 'Hollis'. Hon. J. B. Hill, in his history of Mason, says the name was derived from that of the Duke of New Castle, whose family name was Holles, Mr. Hill using the letter e in the last syllable. From the best evidence at my command upon the question, I have no doubt that Mr. Hill is correct, both in the orthography of the name and also in that of the person for whom the town was called. In the original record of the town charter, now at Concord, and in the copy of the charter on the Hollis record, the name is spelt Holles. In the town records for the twenty-five years and more before the War of the Revolution the name occurs hundreds of times, and, so far as I have seen, is uniformly spelt Holles, as in the charter, and is so spelt in the in the New Hampshire Laws published as late as 1815." see An Account of Some of the Early Settlers of West Dunstable, Monson and Hollis, N. H., by Charles S. Spaulding, published in Nashua, N. H. : The Telegraph Press, 1915. History of the Town of Hollis, New Hampshire, From its First Settlement to the Year 1879..., by Samuel Thomas Worcester, Boston : A. Williams & Co., 1879. History of the Old Township of Dunstable including Nashua, Nashville, Hollis, Hudson, Litchfield and Merrimac, N. H.; Dunstable and Tyngsborough, Mass, by Charles J. Fox. Nashua: Charles T. Gill Publishers. 1846. A Brief History of Hollis, NH, By Joan Tinklepaugh, Historian. *The Nashua Public Library has been recommended to me by a resident researcher, Helena Hayden, for it's extensive collection of New Hampshire town histories. I was not able to visit this library myself, but will be sure to the next time I am in NH. Brown, George Waldo. The History of Hillsborough New Hampshire 1735-1921. Vol. 1. Vol. 2. Published by the Town, Manchester: John B. Clarke Co. 1921. Hurd, Hamilton D. Hillsborough County, New Hampshire. Philadelphia: J. W. Lewis & Co. 1885. Hayden, James; Martha Rogers, Hilda Hildreth, William Wehrle, and Irene West. (Hollis Historical Committee). Where the Past has Been Preserved, Hollis, New Hampshire 1879-1979. Canaan: Phoenix Press. 1997. Little, Henry Gilman. Hollis, Seventy Years Ago - Personal Recollections. Grinnell: Ray MacDonald Printers. 1894. Skeate, Elinor. The Hollis Register. 1996. Spaulding, Charles S. An Account of Some of the Early Settlers of West Dunstable, Monson, and Hollis, N. H. Nashua: The Telegraph Press. 1915. Tinklepaugh, Joan Child. Hollis Family Album - 1730-1950. First Printing March 1997. Available at the Hollis Historical Society. Worcester, S. T. Hollis, N. H. in the War of the Revolution. [no date or publisher given-however, inside front page was handwritten: "S. T. Worcester 1804-1882"]. Hurd, D. Hamilton. History of Hillsborough County, New Hampshire. Philadelphia : J. W. Lewis & Co., 1885. · see An Account of Some of the Early Settlers of West Dunstable, Monson and Hollis, N. H., by Charles S. Spaulding, published in Nashua, N. H. : The Telegraph Press, 1915. · History of the Town of Hollis, New Hampshire, From its First Settlement to the Year 1879..., by Samuel Thomas Worcester, Boston : A. Williams & Co., 1879. · History of the Old Township of Dunstable including Nashua, Nashville, Hollis, Hudson, Litchfield and Merrimac, N. H.; Dunstable and Tyngsborough, Mass, by Charles J. Fox. Nashua: Charles T. Gill Publishers. 1846. The HAYDEN Family of Hollis, NH, by Helena Hayden. The FARLEY Family of Hollis, NH, by Helena Hayden. I transcribed the following Biographical Sketches into this format precisely as they were written by Samuel T. Worcester in his book. In other words, this small section of his book is quoted word for word, both for it's obvious genealogical content, & as a sample of what is found in this wonderful History. It contains a wealth of interesting genealogical & historical information. I did, however, use a highlight color for the names. There is no color difference in the original work, but I felt it helpful for visibility on a web page. Please check your library for availability of this book, and use the sketches I have transcribed here as a quide, to primary records for further research, as I have not verified the accuracy of Worcester's information on any but my own ancestors, & I know I am not infallible, & there may be a typo that I've not seen. Please let my know if a mistake is found. Please do not copy my transcript of these records to any archive without my knowledge or permission. If I make corrections or changes, I would not be able to let you know, & none of us want to perpetuate errors. --Ann Mensch - 1 Jul 1998. Worcester, Samuel T. History of the Town of Hollis, New Hampshire From Its First Settlement to the Year 1879 with many Biographical Sketches of It's Early Settlers, Their Descendants, & Other Residents. Boston: A. Williams & Co. 1879.
was from Andover, Mass. His name was on the Hollis Tax Lists in 1750. In 1755 he was Lieutenant in Capt. Power's company, Col. Blanchard's regiment, in the expedition to Crown Point, and was again in the army in 1757. He was selectman in 1752, '53 and '54. His son Benjamin was a soldier in the Revolution. Died January 5, 1776, aet. 46.
was in West Dunstable in 1738, and signed the petition for the charter of West Dunstable. Married Mary Spears, May 29, 1744. Was a town officer in 1746. His son William was a soldier at Bunker Hill and Bennington. Died August 3, 1757, aet. 39.
came from Groton, Mass. Married Jane Robbins in Groton, in 1731. Was in West Dunstable in 1739, selectman in 1747 and 1748, and was a soldier in the French war in 1757. Representative to the New Hampshire General Court, in 1775, '76 and '77. His sons, Jonathan and David were soldiers in the Revolution. came from Concord, Mass. His name was on the Hollis Tax List in 1749, and he was a soldier in the French war in 1755, in the company of Capt. Powers. His sons Ebenezer, Nathaniel, William and John were soldiers in the Revolution. was from Marlborough, Mass. Settled in the part of Hollis known as Monson, about the year 1754. Himself and three of his sons, viz. Joel, Andrew and Daniel, Jun., were Revolutionary soldiers. Died January 15, 1798, aet. 69.
was in West Dunstable in 1738 and signed the petition for the charter. Was Parish Assessor in 1741 and Collector in 1743. Died April 20, 1760, aet. 54.
is supposed to have come from Dunstable, n. h. He was in West Dunstable, in 1743, and signed the call to Rev. Mr. Emerson. Married Kezia Hastings Dec. 31, 1744. Was tithing-man in 1747, and selectman in 1750 and 1754.
supposed from Groton, Mass. His name is on the first tax list for West Dunstable, in 1740. Married Elizabeth Boyton in Groton, in 1741. He was a soldier in the French war in 1757, and selectman in 1773.
was from Dracut, Mass. Was in West Dunstable in 1738 and signed the petition for the charter; was a soldier in the Revolution as was also his son Josiah, Jr., and is supposed to have died at Ticonderoga in September, 1776.
supposed from Groton, Mass. he was in West Dunstable in 1738 and signed the petition for the charter, and was a soldier in the French war in 1758. Five of his sons, viz., Nathaniel, Francis, Daniel, Timothy and Nathan, were soldiers in the Revolution, the last named of whom was killed at Bunker Hill. supposed from Newbury, Mass. Was in West Dunstable in 1743; parish clerk in 1744. Married Ruth Jewett of Rowley in 1745. Chosen deacon in 1755, and selectman in 1758, 1761, and 1762, etc. His sons John and Jacob were soldiers in the Revolution, the last of whom was killed at Bunker Hill. Died oct. 29, 1787, aet. 67.
supposed also from Newbury. He was in West Dunstable in 1745. married Lydia jewett of Rowley, in may 1745. His sons, Isaac and joel, were Revolutionary soldiers. was in West Dunstable in 1745, and a town officer in 1747. Three of his sons, viz., Joshua, Jun., Benjamin and Elias, were soldiers in the Revolution. came from Salem, Mass., and was in West Dunstable in 1743, and a town officer in 1747 and 1748. He was an ensign in the French war in 1758. Removed to Plymouth, N. H., in 1764.
was also from Salem, and was in West Dunstable in 1743 and signed the call to Rev. Mr. Emerson. Married Kezia Wheeler October 9, 1744. Died May 6, 1776.
was from Chelmsford, Mass. Settled in Hollis about 1760. Was a soldier in Capt. Emerson's company in 1777. his oldest son Ephraim B., Jun., was for many years a deacon of the Hollis church, and his sons, Rev. Josiah B. and Dr. Benjamin B., were graduates of Harvard College. (q. v.) Died July 21, 1784, aet. 46.
was from Salem, Mass. Came to West Dunstable in 1744. Married Catharine Emerson, February, 1745. His two sons, Josiah, Jun., and Abel, were soldiers in the Revolution, and both deacons of the Hollis church. Died December 14, 1756, aet. 44.
came from Billerica, mass., was in West Dunstable in 1738, and signed the petition for the charter. married Elizabeth Smith in 1747. Settled in the part of Hollis known as Monson. His sons, Robert, Benjamin and Nathan, were Revolutionary soldiers. Died july 9, 1783, aet. 66.
was born in Groton, Mass., march 6, 1709; married Prudence lawrence of Groton, july 18, 1732. Was in West Dunstable in 1739 and signed the second petition for the charter. He was the first justice of the peace in Hollis and was chosen town clerk in twenty-two years, between 1746 and 1770. He was sergeant in Capt. Power's company in the French war in 1755. Two of his sons, Samuel and Thomas, were loyalists in the Revolution, and Benjamin, his youngest son, was a Continental soldier. Died January 18, 1772, aet. 62.
was a brother of Samuel Cumings, and born in Groton, October 10, 1711. Married Hannah Farwell in 1736; was in West Dunstable in 1738, and signed the first petition for the charter. He was the father of Rev. Henry Cumings, D. D., the first minister of Billerica, and of Capt. Jotham Cumings, a soldier in the French war of 1755, and an officer in the war of the Revolution. Died october 25, 1747, aet. 36.
is supposed to have come from Groton, and was in West Dunstable in 1744, and chosen Deacon of the Hollis church in 1745. He was ensign in the French war in 1755, in the company of Capt. Powers, and all his three sons, Ebenezer, William and philip, were soldiers in the Revolution. Died September 9, 1758, aet. 46.
came from Billerica, and was in West Dunstable in 1743, and signed the call to Rev. Mr. Emerson. He was a grandson of the noted Massachusetts surveyor of the same name, and was a town officer in 1746. Died March 3, 1747, aet. 33.
came from Bedford, Mass., was in West Dunstable previous to 1736, and was the third settler, and lived on the farm in Hollis now owned by John Coburn on the road to Pepperell. Died December 10, 1748.
was also from Bedford, and by trade a blacksmith; was in West Dunstable in 1743, and signed the call to Mr. Emerson. About the year 1765 he removed to Temple, N. H.
came from Bedford, Mass., was in West Dunstable in 1739, and was a petitioner for the charter. Married Hannah Brown october 7, 1744. His son Benjamin was a soldier in the Revolution. Died November 23, 1797, aet. 79.
was also from Bedford. Was in West Dunstable in 1738 and a petitioner for the charter and was the first inn keeper in West dunstable. he lived first on the farm now owned by T. G. Worcester, about one-fourth of a mile south of the meeting-house. He was parish assessor in 1740 and 7141, and selectman in 1746. Three of his sons, Ebenezer, Christopher and Stephen, were Revolutionary soldiers. Died november 23, 1797, in his 80th year. came from Billerica, and was in West Dunstable in 1743. Killed by the fall of a tree, november 24, 1762, aet. 49.
came from Concord, mass., and was the second settler in West Dunstable. he lived in the south-west part of the twon, and during the French war of 1744 his house was fortified as a guard house. he was parish assessor in 1742. his son John was a soldier in the French war, 1755, and his son Jonas in that of the Revolution. Died August 14, 1757, aet. 53.
came to Hollis from Bradford, Mass. His name is first on the Hollis tax lists in 1752. He was a soldier in the garrison at Portsmouth, N. h., in 1776, and his sons, Phineas, Thomas, Noah and Jesse, were all soldiers in the army. Died March 7, 1813, aet. 86.
was from Littleton, Mass., and settled in what is now the north part of Hollis about 1735. He was a petitioner for the charter of West Dunstable in 1738, and first treasurer of West Dunstable in 1740. Died September 20, 1775, aet. 75.
is supposed to have come to Hollis from Rowley, Mass., in 1751, and married Hannah (Farwell) Cumings, widow of Ensign Jerahmael Cumings, in 1752. He was chosen selectman in 1766, deacon of the Hollis church in 1770, and a delegate to the County Congress at Amherst in 1774 and 1775. All of his three sons, Stephen, Jun., Noah and Jonathan, were soldiers in the Revolution. Died May 23, 1803, aet. 75.
was born in Groton, Mass., October 12, 1705. Married Abigail Lawrence, in Groton, november 23, 1737. Was in West Dunstable in 1743, and a town officer in 1748.
also came from Groton and was in West Dunstable in 1739, and a signer of the second petition for the charter. he was a town officer in 1748 and a soldier in 1777 in the company of Capt. Goss. Died April 11, 1801, aet. 83.
came from Newton, Mass., and his name appears in the first tax list in West Dunstable in 1740. He was selectman in 1771 and 1772, and moderator in 1773 and 1774. Five of his sons, viz., William, Joseph, Benjamin, john and phineas, were Revolutionary soldiers. Died February 15, 1785, aet. 67.
was from Bedford, Mass., and was in West Dunstable in 1738 and signed the first petition for the charter. he was parish collector in 1741. Removed from Hollis to Plymouth among the first settlers of Plymouth. came from Newbury, Mass. His name first appears on the Hollis tax lists in 1747. He was selectman in 1751, and chosen deacon in 1755. his two sons, Enoch and Elijah, were soldiers in the Revolution. Died September 1796, aet. 80.
was from Groton. Married Anna Gilson in 1741, in Groton. He was in West Dunstable in 1743, and was chosen deacon in 1745. His sons, Thomas and David, were soldiers in the Revolution. Died may 1, 1754, aet. 40.
was from Reading, Mass. Married Hannah Nichols, at Reading, june 19, 1751, and came to hollis during the French war of 1754, his name being first found on the Hollis tax lists in 1758. He was selectman in 1771. Died in Hollis, October 17, 1795, aet. 70. His oldest son, William W., was a soldier in the Revolution in 1775, and again in 1778. James, the second son, settled in Maine, and became a successful merchant. his youngest son, hon. Benjamin pool, born january 17, 1771, settled in Hollis, and was many times chosen to important town offices. he was justice of the peace from 1810 to 1822, and justice of the peace and quorum from 1822 till his decease. he was also representative to the New Hampshire General Court from 1804 to 1809, and State senator in the years 1818, '19, '20 and '21. Beside these three sons, Mr. Pool had eleven daughters, ten of whom lived to adult age, and were all married, and most of them became the mothers of large families. he died April 20, 1836, aet. 65.
was the first settler in Hollis. Was born in Littleton, Mass., and married Anna Keyes of Chelmsford in 1728. Settled in West Dunstable in 1730. he was parish committee in 1740 and held many other important parish and town offices. He was the first Captain of the West Dunstable militia, the commander of an expedition to explore the Coos country in 1754, and captain of the Hollis company in the expedition to Crown point in 1755. Stephen, Whitcomb and Levi, three of his sons, were soldiers in the French war in the same company; and four of them, viz., Stephen, Francis, nahum and Samson were soldiers in the Revolution. Died August 22, 1757, aet. 56.
came from Chelmsford, Mass. Was in West Dunstable in 1738, and signed the first petition for the charter. he settled in the west part of the town on Proctor hill, which was named for him. His name is found on the first West Dunstable tax list in 1740, and he was selectman in 1749. The life of Mr. Proctor is said to have been shortened by the bite of a rattlesnake, and he afterwards waged so successful a war of extermination against those reptiles that no rattlesnakes have been known in Hollis since his death. Died May 21, 1780, aet. 73.
was born in Concord, Mass., and came to West Dunstable previously to 1738, and was agent of the inhabitants with Capt. Powers in obtaining the charter. in 1740 he gave the land for the Hollis meeting-house, burial ground and common. he was parish assessor in 1740, '41, '42 and '43. Died june, 1743, aet. 36.
came to hollis from Rowley, Mass. his name appears first on the hollis tax lists in 1747. he was selectman in 1769 and 1770. his son, Capt. William Tenny, was a soldier in the Revolution. Died march 22, 1783, aet. 61.
is said to have come from Salem, Mass., and settled in the part of Hollis known as Monson. he was a petitioner for the charter of West Dunstable in 1738, and his name was on the first West Dunstable tax list in 1740. He is said to have been noted in his day for his exploits and success in hunting, especially of bears. He was a soldier in the French war in 1755, and his sons, Ebenezer and Lebbeus, were soldiers in the Revolution. Died March 28, 1772, aet. 67.
came from Billerica. He was in West Dunstable in 1745 and was a soldier in the French war, in the years 1755, 1757, and 1758. his son, John W., Jun., was a captain in the war of the Revolution in the regiment of Col. Webster. Died February 2, 1793, aet. 85.
was born in Bradford, Mass., June 7, 1698. Married Abigail Carleton, of Rowley, in 1720. Was settled as a Congregational minister in Sandwich, Mass., for ten years before coming to Hollis. Removed to Hollis in 1750. Afterwards preached as an evangelist in New Hampshire, but was nto again settled in the ministry. He was the author of a small volume of "Meditations" in verse, written in his sixtieth year. Also of several moral and religious essays reprinted in 1760, entitled "A Bridle for Sinners and a Spur for Saints.' His oldest son was Dea. Francis Worcester. His second son, Jesse, was a soldier in the French war, was taken prisoner, and died at Montreal, in 1757. His youngest son was Capt. Noah Worcester. Died October 14, 1783, aet. 85.
was the oldest son of Rev. Francis Worcester. Born at Bradford, March 30, 1721. Married Hannah Boynton, of Newbury, Mass., October 28, 1741. Came to West Dunstable in 1744. Was chosen deacon of the Hollis church in 1746. he was selectman in Hollis six years, moderator of the annual town meeting eleven years, and town treasurer twenty years, between 1746 and 1768. In 1768 he removed to Plymouth, N. H., and was deacon of the church at Plymouth; representative to New Hampshire General Court in 1777 and 1778, and State councillor in 1780, 1781 and 1783. Died october 19, 1800, aet. 79.
came from Woburn, Mass., was in West Dunstable in 1739, and signed the second petition for the charter. he was selectman in 1749 and 1769. A soldier in the French war in 1760, and Captain of the Hollis militia company, in 1775, and previously. His sons, Lemuel and Uriah, were soldiers in the Revolution. Died August 5, 1776, aet. 60. Dinsmore. K. S. C., Oct. 27, 1919. "There seems to be evidence that Hannah wife of Thomas Dinsmore of Bedford, Mass., and Hollis, N. H., was a daughter of John Whitaker of Stow and his wife, Hannah (Ball) of Concord, married Dec. 12, 1705. John Whitaker died testate, May 7, 1746, and his will, dated Dec. 20, 1745, proved June 16, 1746, provides for three daughters, Mary "Steward," Lydia Taylor, and Hannah "Densmore," besides an only son, John Whitaker, Jr. David Whitaker was a witness. The birth of John, Jr. is recorded at Stow, May 26, 1713, but those of his three sisters do not appear. Lydia Whitaker married Abraham Taylor of Dunstable, Jan 21, 1730-1, and settled in Hollis, where she died Sept. 23, 1795, aged 83. Hannah was probably the eldest child and named for her mother; I find no record of the marriage to Thomas Dinsmore. The daughter Mary Stewart's legacy was in the charge of Deliverance Wheeler of Stow as trustee, and his account shows she had a child born within two years of her father's death. Can anyone supply the name of her husband?" Chandler, Charles Henry. History of New Ipswich, NH 1735-1914. Fitchberg:Sentinel Printing Co. 1914. THE MASONIAN CHARTER Province of New Hampshire} "Pursuant to the Power & Authority Granted & Vested in me by the Proprietors of Lands purchased of John Tufton Mason Espr in the Province of New Hampshire aforesaid by their Vote the 16th of June 1749, passed at their Meeting held at Portsmouth in said Povince-- I do by these Presents give & grant unto.....all of a place called New Ipswich, Hannah Dinsmore, Peter Powers, Daniel Emerson, David Nevens, all of Holles,...& all in the Province of New Hampshire,...To them, their Heirs & Assigns, on the Terms Conditions, Reservations & Limitations, & in the Respective Proportions, hereafter expressed, all the Right, Title, Interest, & Property of the Grantors aforesaid, of in & to that Tract of Land, or Township lying in the Province of New Hampshire aforesaid and the Province of the Massachusetts Bay at the Southwest Corner of the Township call'd No. 1, from thence North 80 degrees West 6 miles to the SE corner of the Twp. called South Manadnock..." Hannah Dinsmore: 2 Lots. Copyright 2002-2016, by Ann Mensch.